By Mark Watson, Marketing Product Specialist, Cincinnati Inc.
Bottom bending, air bending,complementary angle, blank development, outside setbacks, neutral axis, K-factor – there’s a lot more to bending metal than just, well, bending metal. On top of the multi-faceted aspects of running a press brake, operators wage ongoing battles with their machines to maintain tolerance levels throughout the course of any given day. Needless to say, all of those tasks – setting up jobs, checking bend quality, machine adjusting and readjusting – take a toll on productivity and ultimate profitability. Fortunately, however, press brake manufacturers are providing an array of options to address the situation. Today, two basic bending methods are used in metal forming: Bottom bending and air bending. The bottom bending process requires ample tonnage to force the metal into the exact angle of the punch and die. There is one punch and die combination for each desired angle. The process is very repeatable and it remains in use where large volumes of one part are made to exacting tolerances. While this method has served the industry well for many years, it is not without its drawbacks. First, because the punch and die are limited to making a single angle, the process requires constant tooling changes and recalibration for each new part or job. Second, the tonnage required for bottom bending is significantly more, requiring larger press brakes. Finally, because of the increased tonnage requirement, the costs associated with tool damage and tool clamping damage are a more significant portion of the cost per part. In recent years, air bending has become the more preferred method of press brake forming. Air bending requires only 20 to 40 percent of the required tonnage necessary for bottom bending. When air bending, the material is bent slightly beyond the desired angle and allowed to spring back to the desired angle. Parts similar to those that were made with bottom bending can now be made with a press brake that has less than half of the tonnage rating. The smaller machines also cost less and often run faster. However, the greatest advantage of air bending is its impact on versatility and flexibility. The process allows manufacturers to fabricate a wide range of parts without time-consuming tool changes. Because the tools used in the air bending process allow the operator to create a part with angles that are completely different, the reduction in tool changes and single bend work-in-process is significant. Because of its many advantages, air bending is the metal forming method of choice for most of today’s manufacturers. Air bending, however, can have its challenges. The varying properties of certain materials can result in inconsistent angularity. That is, the springback can vary significantly depending on changing chemical properties of the workpiece. A comparison of bottom bending and air bending for press brakes. Bottom bending (left) yields an angle exactly matching the machined geometry found in the tools. Air bending (right) allows for various angles, depending upon the penetration of the punch, without a tool change. well as part top versus bottom direction also affect angularity. The LazerSafe Iris+ measures parts and makes corrections, if necessary. It’s also used for protecting the point of operation on every part regardless of the use of angle measurement. While it’s true that air bending isn’t as accurate as bottom bending, it does represent the best versatile option for manufacturers looking to maximize press brake production. Because of these and other issues, press brake operators are forced to continually perform tolerance checks and make on-the-fly machine adjustments in order to maintain part quality throughout the production run. This repeated series of bending, measuring, adjusting, rebending, remeasuring and re-adjusting slows the process – negating much of the time-saving advantages of air bending. Consequently, manufacturers who might otherwise try to avoid bottom bending are often forced to revert to that method for achieving the production run accuracy that some jobs require. To further complicate the situation for those that need to revert to bottom bending, a growing number of press brake manufacturers no longer support the bottom bending process in their control software. While it’s true that air bending isn’t as accurate as bottom bending, it does represent the best versatile option for manufacturers looking to maximize press brake production. As a result, press brake manufacturers have taken steps to enhance air bending to address these issues. 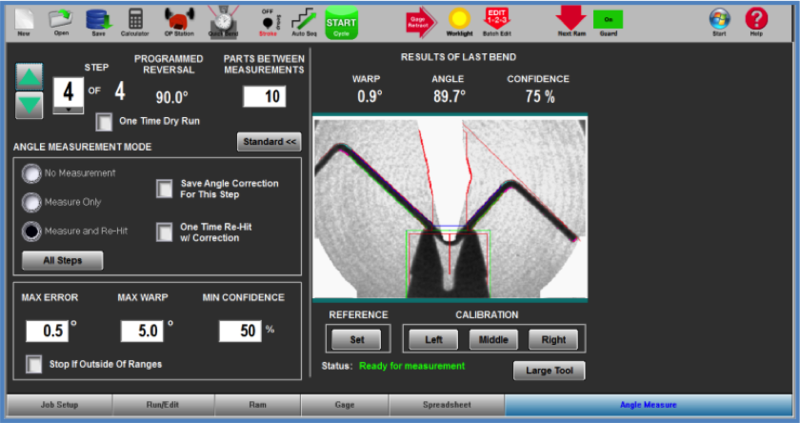 The most promising enhancement is in-process angle measurement and correction. Control software allows the operator and management to easily calibrate the press brake operation, input the maximum bend tolerance for each bend in a part program and choose from a variety of measurment and correction modes. One solution for this enhanced process attaches measurement instruments to the machine or tooling to physically measure angles by probing the part’s flanges. On one type of machine, the data is gathered by probes near the front and back of the lower die. On another, the probes are found integrated with special punches in the upper tooling. In either case, the probe information gathered establishes a value for the angle that has formed. If the angle is not correct, a corrective re-hit is performed. Today, press brake OEMs are taking steps to address the shortcomings of air bending by employing systems that maintain accurate part tolerance. A second solution manages bend angles through the use of an external laser transmitter and receiver system. The laser beam casts a visible target on the bottom of the exposed flange. The receiver portion then evaluates the size and distance of the target’s reflection. Similar to the mechanical probe system above, data is gathered by the laser receivers near the front and back of the lower die. The reflection information gathered establishes a value for the angle that has formed. If the angle is not correct, a corrective re-hit is performed. A third method employed by Cincinnati Inc. (CI) was developed to leverage data from a Laser AOPD safety system. The LazerSafe Iris+ simultaneously creates a safety zone for operator protection while it also collects angle measurement data for the workpiece. The measurement information gathered establishes a value for the angle that has formed. If the angle is not correct, a corrective re-hit is performed. Available on CI Maxform, Autoform and Goform press brake models, this optional feature allows fabricators to choose from many productive modes of measurement operation. The technology driving each system depends on the ability of the sensor to adequately detect the part. As a result, if the portion of the workpiece under examination is resistant to sensing, smaller than necessary for adequate sensing or outside the sensing range, the measuring technology breaks down. Additionally, if the process of forming parts is more “rough and tumble,” some angle measurement systems may not be right for that shop. Here are some questions to discuss with a press brake provider to determine the best solution. What metal forming method will be employed and what machine size is needed? What enhanced method does the machine employ to ensure angle accuracy? Does the machine offer automated features to monitor and correct angle variations? How durable is the sensing system for the type of production? Are the flanges in the production long enough to be seen by the sensors? Is material reflectivity consistent enough for good laser reflection sensing? With the shop’s standard tools, can the part and tool combination fit within the sensing zone? transmitter/receiver units are clearly a step in the right direction, there may be a better way. By using data from a Laser AOPD safety system to minimize air bending’s drawbacks, CI’s Angle Measurement System turbo-charges air bending operation— allowing fabricators to safely accelerate metal forming productivity and reap the full versatile and efficient benefits of their press brake’s air bending capability.